Oumi Daijo was a title reserved only for the most preeminent craftsmen. The meticulous care and expertise poured into this chronometer, one of Hisashige's principal masterworks, makes it clear how much he deserved the honor. It combines a Western timepiece with a Japanese traditional clock, which divides time between sunrise and sunset into six parts. This creation reflects Hisashige's mindset and methodology -- taking and using Western technology while adapting it to the cultural needs of Japanese society. Recently, Hisashige's technological contributions have attracted renewed attention and re-evaluation. 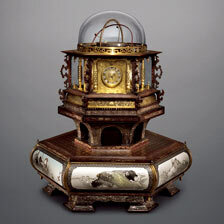 In 2004, Japan launched a national project to disassemble, restore and reproduce the Man-nen Dokei chronometer.